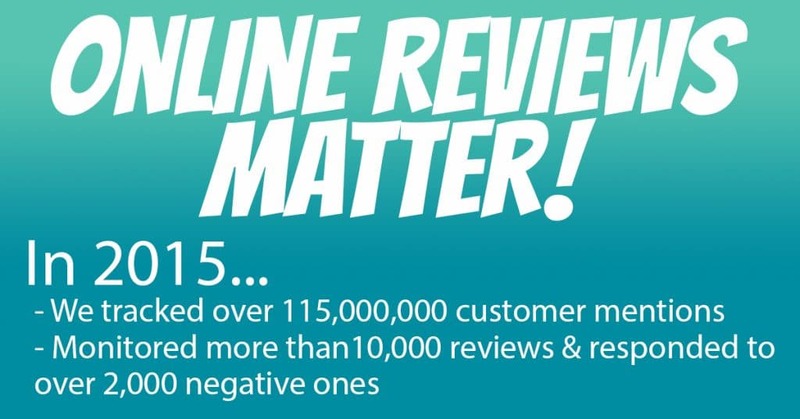 Online Reviews Matter. Are You Listening? When we tell people that we provide Internet marketing services, they often just think about the advertising that goes into marketing. However, we take a comprehensive approach to your web presence, and that includes reputation management. After reviewing our FEC and Amusement Park marketing survey, it’s clear that reputation management is dead last when it comes to marketing priorities. You would think that this might be the exact opposite for an industry that attracts millions of visitors from all over the world. Would it make sense for a restaurant to not worry about their Yelp reviews? What if a hotel ignored complaints on Tripadvisor? We felt so strongly that every small business (trampoline park, roller skating center, bowling center, bounce house center) required reputation management that we spent 2015 converting over half of our customers to the service. Since making the change this year, we have tracked over 10,000 online reviews and responded to over 2,000 negative reviews. Our Web Operatives have been responsible for monitoring over 54 million Facebook check ins and 115 million brand mentions for our customers using the service. As of 2015, we have refused to write a contract without the service.